Installation of 'Maid of the Bridge'. 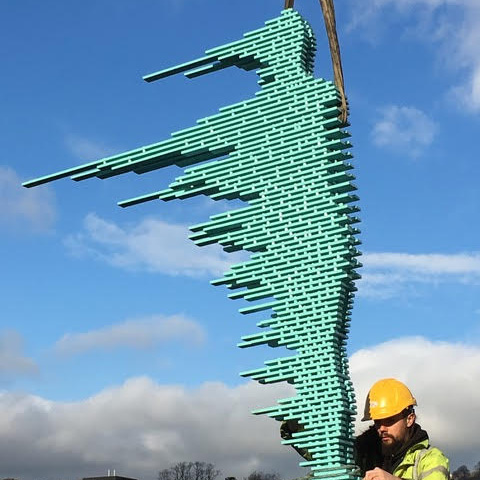 ACS member Anna Gillespie unveiled a new public sculpture in Bath on 23 November 2018. 'Maid of the Bridge' forms part of the new Riverside development in the city of Bath. Situated close to the newly restored and pedestrianised Victoria Bridge, the 4-metre high sculpture has been constructed out of Victorian-era wrought iron that was salvaged during the restoration of the Bridge in 2015 and recast into this fantastic new contemporary sculpture. Inspired by Gillespie's recent 'Blown Away' series of sculptures, 'Maid of the Bridge' has been crafted to follow the flow of the River Avon which she now overlooks. Funded by Crest Nicholson, the project was curated by Peter Dickinson. Local company Buro Happold Engineers oversaw the structural engineering of the sculpture, which was constructed by craftsmen from Ironart of Bath in collaboration with the artist.